AMD's Radeon HD 7970 is good. 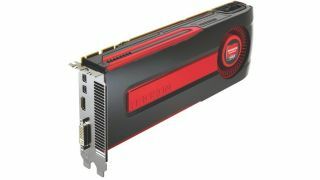 The new Radeon R9-290X will be great. AMD's new uber-GPU, codenamed Hawaii and likely to be known as the Radeon R9-290X when it launches next month, might just be the fastest graphics chip the world has ever seen. That's the latest from the inevitable pre-launch rumour mill. But even if Hawaii doesn't turn out to be faster than Nvidia's mighty GTX Titan, the fact that it's arriving at all is very good news. It underlines that the race is still on between AMD and Nvidia for the crown of fastest graphics chip and makes the lack of competition in the CPU market even more crushingly obvious than it already was. For the record, what we know about Hawaii goes like this. A senior AMD suit recently revealed that it remains on the 28nm production process from TSMC. Apparently the new 20nm node isn't ready for full-scale production. Certainly not full-scale production of a very large enthusiast-class GPU. That same suit also revealed that Nvidia's Titan is still around 30 per cent than Hawaii. If that sounds like advantage Nvidia,well, it still leaves space for a significantly larger and more complex GPU than Tahiti. That's AMD's incumbent bad-boy GPU as found in the Radeon HD 7970. Do the maths and Hawaii should come in well above 400mm2. As for how many stream shaders that equates to, the latest rumours suggest 2,816. AMD's 7970 sports 2,048. Again, extrapolate out from that shader count, bung in a few further tweaks, maybe a small clockspeed bump, and Bob's your pixel-pumping blood relative on your mother's side. You've got a GPU faster than Titan and nothing imminent due from Nvidia. What's more, while Hawaii won't be cheap, I doubt it will be priced anywhere near the £800 Nvidia continues to charge for Titans. Go AMD? Indeed, and like I said it's not actually terribly critical that it actually beats Titan. As long as it's close while being a lot cheaper it will give gamers looking for the best performance a great new alternative. And that, folks, is the benefit of actual competition in the graphics market. Progress in both performance and bang-per-bang terms. While all this is going on, Intel has just rolled out its latest so-called flagship CPU, the Core i7-4960X, and it's such a massive disappointment, it probably deserves a stand alone rant of it's own. So, that's what I'll give. Keep your scanners peeled.